As a result of detecting hexavalent chromium in a well near the Colorado River in 2004, the California Department of Toxic Substances Control (DTSC)The department within the California Environmental Protection Agency in charge of the regulation of hazardous waste from generation to final disposal. DTSC oversees the investigation and cleanup of hazardous waste sites. required the Pacific Gas and Electric Company (PG&E) to perform a series of Interim MeasuresCleanup actions taken to protect public health and the environment while long-term solutions are being developed. to extract and treat the impacted groundwaterWater beneath the Earth’s surface that flows through soil and rock openings (aquifers). at the Topock Project Site (Site) to control the movement of the hexavalent chromium plume to protect the Colorado River. The initial extraction and treatment of the groundwater, known as Interim Measures No. 2 (IM2), took place on a small strip of land owned and managed by the U.S. Bureau of Land Management (BLM) known as the MW-20 bench. This area is approximately 600 feet west of the river and is next to the National Trails Highway. In June 2004, DTSC agreed with PG&E’s evaluation that increased extraction was needed to control the direction of groundwater flow during low river water level elevations in winter months. In July of 2005, PG&E built and began operation of larger-capacity extraction and treatment facilities, known as Interim Measures No. 3 (IM3), which replaced the smaller-quantity extraction and treatment under the previous interim measures. IM3 remains in operation until the Groundwater remedy is constructed. The IM3 facility will stop operation once the remedy begins and the facility will be decommissioned and removed when DTSC determines that the remedy is operating properly and successfully. Double-walled piping and a leak detection system ensure that contaminated groundwater is safely contained while being transported to the treatment facility. The treated groundwater produced by IM3 meets California, Arizona, and federal drinking water standards for chromium levels. For a map of IM3, see the figure below. To measure the success of the Interim Measures, water levels are monitored in specific key well pairs to ensure that the groundwater continues to flow away from the Colorado River. The Interim Measures at the Site are considered temporary actions intended to protect the Colorado River until the final cleanup plan can be designed, constructed, and implemented. For more detailed information on IM3, please see below. Photos of IM3 are located on the Interim Measures 3 photos page. Please also refer to the IM3 map on this page. Environmental investigations and groundwater monitoring data gathered over the last decade indicate that direct discharge of solid waste and wastewater containing chromium and other potential contaminants have affected the soil and groundwater at the Site. The affected groundwater beneath the Site is commonly referred to as the chromium plumeA body of contaminated groundwater. The movement of a groundwater plume can be influenced by such factors as local groundwater flow patterns, the character of the aquifer in which the groundwater is contained, and the density of contaminants., and it extends northeast from the Station under adjacent federal lands. In December 2003 and early 2004, detections of hexavalent chromiumHexavalent chromium is a form of chromium. Chromium is a metal naturally found in rocks, soil, and the tissue of plants and animals. Hexavalent chromium can be found naturally at low concentrations, but it is also used in industrial products and processes and is a known carcinogen. On May 28, 2014, the California Department of Public Health adopted a new California drinking water standard at 10 parts per billion for hexavalent chromium. 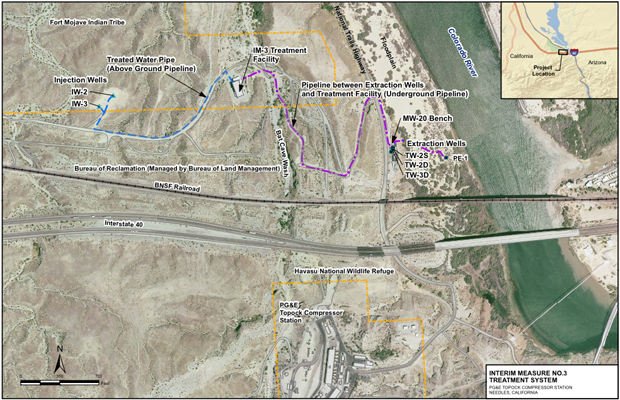 in a floodplain monitoring well located approximately 60 feet west of the river prompted DTSC to take immediate action to ensure that groundwater containing chromium did not reach the Colorado River. DTSC directed PG&E to take immediate actions, called Interim Measures, to ensure that the groundwater plume under the floodplain flows away from the Colorado River. DTSC also completed Notices of ExemptionThe environmental document that is prepared for projects or actions that meet specific criteria for exemption from the requirements of the California Environmental Quality Act. Examples of actions meeting such criteria include those taken to restore property damaged in a disaster area and specific actions designed to prevent an emergency. under the California Environmental Quality Act (CEQA)A law mandating review of environmental impact of governmental action. It requires that public agencies study the significant environmental effects of proposed activities and that the public be informed and allowed to comment on project decisions. for the construction and operation of the Interim Measures. On March 8, 2004, PG&E began pumping (or “extracting”) contaminated groundwater from beneath a small area of BLM land approximately 600 feet west of the river, known as the MW-20 bench. PG&E initially shipped the extracted water offsite for disposal, and subsequently treated the extracted water in batch tanks and transported the water offsite. The groundwater extraction was targeted at the most contaminated part of the plume, where concentrations as high as 13,000 parts per billion (ppb)A unit of measure used to describe levels or concentrations of contamination. One part per billion is the equivalent of one drop of contaminant in one billion drops of water. of hexavalent chromium had been measured during groundwater monitoring events. This groundwater extraction and treatment operation at the MW-20 bench was known as Interim Measures 2, or IM2. In August-September 2005, the IM2 Batch Treatment Facility was put in standby mode when the new IM3 began operation (see below). The treatment facility was then dismantled and removed from the Site during January 2008 - January 2009. Soil confirmation sampling was conducted, and a Closure Report was submitted to San Bernardino County, who had jurisdiction of the treatment system, in June 2009. In June 2004, DTSC concurred with PG&E that groundwater should be removed at higher rates than possible with the IM2 operation to ensure that hexavalent chromium would not move toward the Colorado River. DTSC approved PG&E's proposal to install facilities, including a treatment plant, to increase the rate of groundwater extraction to 135 gallons per minute. The groundwater extraction, treatment, and injection systems are collectively referred to as Interim Measure No. 3 (IM3). Currently, the IM3 facilities include a groundwater extraction system, conveyance piping, a groundwater treatment plant, and an injection well field for the discharge of the treated groundwater. DTSC issued a Notice of Exemption in accordance with the CEQA for this effort. PG&E completed construction of the IM3 facilities in July 2005. In addition to higher rates of groundwater extraction, IM3 also enabled the treated water to be injected back into the groundwater at the Site. This meant that the groundwater, a valuable natural resource, would remain in the local aquifer. PG&E received approval from the Colorado River Basin Regional Water Quality Control Board (Water Board) to inject treated groundwater back into the local aquifer. The permit, known as Waste Discharge Requirements (WDRs), was issued on October 13, 2004. In July 2005, injection of treated groundwater began at two injection wells located west of the facility. The groundwater Compliance Monitoring Program (CMP) for the IM3 injection area was established to monitor changes in groundwater hydraulics and/or water quality in the injection well area, and to ensure that the quality of the aquifer is not adversely affected by the injected water. Under the CMP, 17 wells are sampled semiannually and annually. Injecting treated groundwater replenishes the local basin and reduces the need for trucking treated groundwater offsite. Only solid waste and waste salt water, containing chromium solids, laboratory waste, and oily waste resulting from the IM3 treatment facility process, are currently being trucked offsite for disposal. On September 20, 2006, the Water Board issued new WDRs for continued injection until implementation of a final remedy or until September 2011, whichever occurred first. The WDR (WDR Order Number R7-2006-0060) expired on September 20, 2011, and was replaced by the Applicable or Relevant and Appropriate Requirements (ARARs) for waste discharge as documented in Attachment A to the Letter Agreement issued July 26, 2011, from the Water Board to the U.S. Department of the Interior (DOI), and the subsequent Letter of Concurrence issued August 18, 2011, from DOI to the Water Board. The 2011 ARARs presented by the Water Board that DOI concurred with can be found to the left as Attachment A. The treatment facility uses a multistep process to ensure that the treated groundwater meets the beneficial use standards for the Colorado River (as specified in the Water Board’s Basin Plan) of 50 ppb total chromium, which includes trivalent chromium and hexavalent chromium. This standard is more rigorous than the Arizona and federal government drinking water standard of 100 ppb total chromium. The first step of the treatment process is the introduction of chemicals, such as iron (in the form of ferrous chloride), to a mixing tank at the treatment plant to convert the extracted groundwater containing hexavalent chromium to a trivalent chromium state. In a trivalent state, the chromium turns into a solid material in water. This water-solid mixture is then pumped into a clarifier, which removes the majority of the solids into a chromium-containing sludge that is trucked offsite for disposal. The remaining water is pumped through a microfilter that removes any remaining small, solid particles. After this treatment to remove hexavalent chromium, a portion of the groundwater is treated by a process called reverse osmosis, which removes dissolved salts from the water. This step is necessary because the aquifer water in the injection area is less salty than the extracted groundwater. The reverse osmosis process results in a water stream and a high-salt content (brine) waste stream. The water stream is re-injected into the local aquifer by the injection wells, and the brine water is trucked offsite for disposal. The IM-3 groundwater extraction and treatment system has extracted and treated approximately 826,937,770 gallons of water and removed approximately 7,290 pounds of total chromium from August 1, 2005 through December 31, 2017. The Site is part of a larger geographic area that is considered sacred by the Fort Mojave Indian Tribe and by other Native American Tribal Nations. DTSC concluded that the 779.2‐acre Site “appears to qualify as a historic resource under CEQA as an area that is significant in the social and cultural annals of California,” and the BLM also has determined that a traditional cultural property or property of traditional religious and cultural significance that is eligible for listing in the National Register of Historic Places exists in the area of the Project, within the current Area of Potential Effect, consisting of 1,600 acres of surface area and a section of the Colorado River. Among the larger and better known cultural resources on the Site is an expansive desert geoglyph or intaglio known as the Topock Maze. For these reasons, all remedial activities at the Compressor Station are planned in such a way as to minimize impact to this area. Impacts to cultural and archaeological/historical and biological resources will be minimized by implementing the mitigation measures required by the Mitigation Monitoring and Reporting Program adopted by DTSC in 2011 as part of the certified Environmental Impact Report (EIR), the certified groundwater Final Subsequent EIR, as well as measures under the Programmatic Agreement, the Cultural and Historic Properties Management Plan, and in consultation with Tribal Nations throughout the investigative and remedial activities. A large portion of the Site and surrounding area is within the Havasu National Wildlife Refuge. Portions of the Site are also located in a Riparian and Cultural Area of Critical Environmental Concern and the Topock‐Needles Special Cultural Resource Management Area, designated under the BLM Resources Management Plan. Impacts to biological resources will also be minimized by implementing management measures required by the Programmatic Biological Assessment (PBA) and the Avoidance and Minimization Measures required by the California Department of Fish and Wildlife. PG&E has also worked closely with biologists to ensure appropriate measures are taken to protect sensitive desert habitat during all aspects of Project implementation. A PBA was completed in January 2007 to cover remediation and investigation projects at the Site up to the final groundwater remedy. On December 27, 2012, the 2007 PBA was modified and extended for 5 years (until 2017). Authorization for the extension and modification of the 2007 PBA can be found here. A new PBA was submitted on April 28, 2014, and covers activities related to implementation of the groundwater remedy. The 2014 PBA can be found here. For habitat improvement, mesquite trees were planted on the Havasu National Wildlife Refuge and a drip irrigation system was installed to ensure their survival. Surveys and monitoring to ensure biological and cultural resource protection will continue to be a priority as investigative and remedial activities progress at the Site. Site investigation work plans and associated key documents are available at the information repositories and online in the Document Library.